This post is all about the TCTShow (3D printing) - I'm asking for people to get involved with the show, exhibit if you can and generally let me know if you would like to be part of it. We all had great fun last year, for a review of the 2013 show take a look on my blog here, I hope you can make it for this year. I’m helping out again at the TCT Show on the RepRap Community Hub; spaces are available for the communal area and also dedicated Maker community Pod’s for the show. It’s a 3 day show this year, September 30th, October 1st and 2nd. It should be packed with both exhibitors and visitors over the show days both in and around the Birmingham NEC. 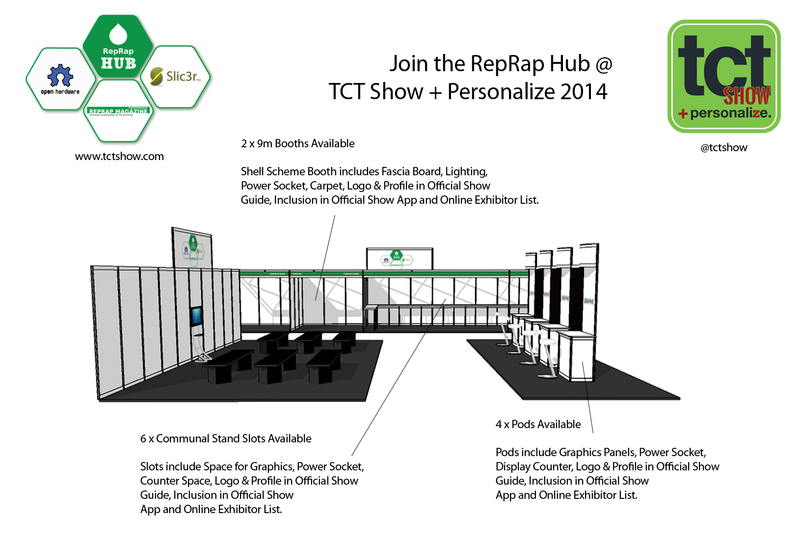 This year TCT is (very kindly) doing all the stand graphic panels, build and setup for the RepRap zone, so it’s easy to book a space and just bring machines, materials and whatever else you need to demo, promote or show. TCT are handling all the bookings and costs for exhibiting, they have generously discounted the cost of floor space and also produced all the Maker/RepRap graphics and branding for the zone. If you are interested in home 3D printing this area will get a lot of attention as it did last year, it’s a great way to stand out. The RepRap community hub also has dedicated seating and networking space, if you wish to use this space for a product demonstration, discussion or presentation of a topic or subject about 3D printing do let me know. Normal stand space at the show is also available if you prefer to do your own graphic’s branding and/or stand build etc. TCT also have dedicated start-up zone ‘pods’ if you think that’s more appropriate for you. You can e-mail me, message me here or on Twitter (@richrap3D) or leave a message on this thread. As with most things RepRap, this only works by people getting involved and giving their time and energy (for Free), If you can help out or want to donate materials, objects or anything else, it would be most appreciated as we (RepRap Magazine and helpers) have no funds or budget, just pure enthusiasm, positive energy and love of this wonderful community. TCT are planning further press releases for the show soon, so if you want to take part and be involved in this fantastic 3D printing event, let me know as soon as you can. Last year was great so I would encourage as many as possible to come visit or get involved. Good idea! Is there a preferred Key Ring design, or 'give away' object around or will I just draw something up? I've signed up with Rich to help out at the RepRap Community Hub, so can print a few give-away's in advance and bring them along. I don't have a design as yet - it could be a cool community challenge to source one though. It would be nice if it made it clear to go to reprap.org as a community site and was in a form that was very quick and simple to print, yet looked cool for visitors. I'll be there with the rest of the E3D gang - we've a stand just on the edge of the RepRap Hub right on the corner so we should be right next to all you guys. We've got some cool touchy feely interactive bits for people to experience different materials and other bits. What do others have planned? To kick things off I've put up another post ( [forums.reprap.org] ), linking back to this one, in which I've shared a simple design that is quick enough to print and promotes "RepRap.org", suitable as show giveaway! I've appealed for others to join in and share their designs. Hopefully more folks will come along with other designs! Edited 1 time(s). Last edit at 08/20/2014 09:42AM by NumberSix. Thanks for the support guys, giveaways and sample printed parts in all sorts of materials will help us look much more interesting for anyone visiting. Does anyone else have anything they would like to show on the RepRap Community Hub stand? New machines, tech, prints or applications? I was steered towards you by Nick Harper. This is a very tentative approach. I've recently run a London-based briefing on 3D printing, involving a speaker from Singapore. I'm actually based in Falmouth, and, wearing another hat, I'm looking for a speaker and/or demonstration of how 3D printing can contribute to the artistic world. Accepting the fact that Falmouth is in the far South West, do you have views on who might make a good speaker? Also, can you point me to particularly interesting cases where 3D printing is actually being used for artistic purposes? Any advice will be welcome. In return, I will be happy to link up on LinkedIn, if you're listed on that. I bring a useful Asian-oriented network to the party.